1. If 50% of (A+B) = 75% of (A-B) then what is the value of (2A-3B)/(A+B)? 2. One-fifth of 375 is what percent of 225? 3. What is 26% of 36% of 25/13 of 2100? 4. Ritu’s salary is 25% less than Geethu’s salary then Latter’s salary is how much percent greater than former’s salary? 5. In the given figure AB|| CD, CD||EF, EF||GH and AG=120 cm. Find the value of CE. 6. In triangle ABC which two angles are equal? In isosceles triangle angles opposite to the congruent sides are equal. 7. A person makes 2 toys per hour while his son breaks 5 toys per day. Both works together for 20 hours a day then what is the number of dolls available for sale at the end of 2 days? 8. Cos (π+30)=x. What is the value of x? 9. Cost Price of a motor bike and bicycle are in the ratio 5:1. Motorbike is marked 10 % above the cost price and bicycle is marked 20% above the marked price. Total selling price is 83750. What is the selling price of bicycle? Let the cost price of motor bike and bicycle be 5x and x respectively. Reflex angles are angles measuring greater than 180 degrees and less than 360 degrees. 1) If 50% of (A+B) = 75% of (A-B) then what is the value of (2A-3B)/(A+B)? 2) One-fifth of 375 is what percent of 225? 3) What is 26% of 36% of 25/13 of 2100? 4) Ritu’s salary is 25% less than Geethu’s salary then Latter’s salary is how much percent greater than former’s salary? 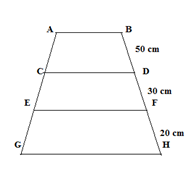 5) In the given figure AB|| CD, CD||EF, EF||GH and AG=120 cm. Find the value of CE. 6) In triangle ABC which two angles are equal? 7) A person makes 2 toys per hour while his son breaks 5 toys per day. Both works together for 20 hours a day then what is the number of dolls available for sale at the end of 2 days? 8) Cos (π+30)=x. What is the value of x? 9) Cost Price of a motor bike and bicycle are in the ratio 5:1. Motorbike is marked 10 % above the cost price and bicycle is marked 20% above the marked price. Total selling price is 83750. What is the selling price of bicycle?